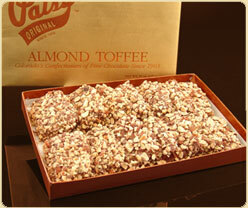 Patsy's Pride of the Rockies Almond Toffee in various sized gift boxes. Patsy’s toffee is a medley of divinely rich flavors. Buttery crunch of caramelized toffee dipped in a thick smooth creamy layer of milk chocolate and topped off with rich, full flavored roasted almonds. 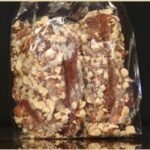 Almond English toffee is our most popular confection.